Whether they're just waking up from a nap or simply expressing their contentment, these twelve yawning cats are totally awesome. If you've spent any amount of time around a cat, chances are you've seen him yawn. And yawn. And yawn. Cats are masters of the yawn, partially because they're also masters of sleeping more than 16 hours every day. Their interesting teeth and long whiskers make cat yawns even funnier. In fact, yawning cats can be a lot of fun to watch. And they definitely aren't ready to spring it forward for Daylight Savings. 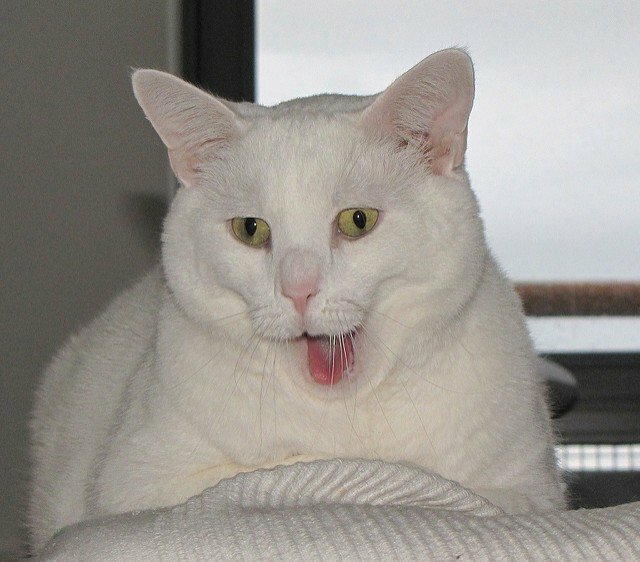 These twelve cats have been captured in the midst of some awesome yawns. Thanks to some handy photography work and silly cats, you can now feast your eyes on these funny, awesome yawning cats. So why, exactly, do cats yawn? Cats often yawn as they're going to sleep or waking up. Yawning is a way to bring in a large volume of oxygen quickly into the body. But for cats, yawning can also be a way to communicate the fact that they're content. You may notice that your cat yawns when he's very relaxed, or when he curls up next to you on the couch. You have an unusually clear view of the insides of your cat's mouth when he yawns. Try to use the opportunity to check your cat's teeth and mouth for damage or injury. If you suspect that there's something wrong with your cat's mouth, then schedule a vet appointment to have him checked out.